Jordan grew up in San Antonio, Texas. She graduated from the American University of Paris with a degree in International Economics. She then moved to Istanbul, Turkey, where she was employed by the brokerage firm FinansInvest, and conducted quantitative market analysis of the Istanbul Stock Exchange. Following the collapse of the Turkish Lira in 2001, Jordan returned to the States and was working for Wells Fargo in New Mexico when she met her future husband. Jordan and David founded CAVU in 2004 and moved to Costa Rica as a hub for operations throughout Latin America. With the exception of a much-needed sabbatical after the birth of her second daughter, Jordan has served as CAVU’s Executive Director since its inception. She has managed a growing staff and all financial matters, as well as important creative and strategic decisions. With our return to the United States and a home in Santa Fe, Jordan now serves as an active board member of Communities in Schools of Santa Fe. 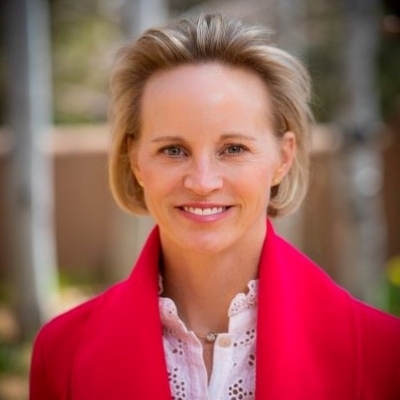 She directs funding from the Jordan and David Smith Fund at the Santa Fe Community Foundation, focusing on education, the environment and economic development. She also serves as a director of the St Catherines Island Foundation. When she’s not busy with the various endeavors of work life Jordan enjoys skiing, yoga, cooking and camping. She loves languages, cultures, human relations and problem-solving.